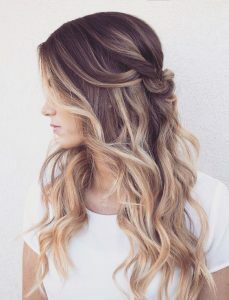 Balayage is a hair color technique imported from France. Inspired by naturally sun kissed hair, the Balayage technique intends to lighten hair where the sun might naturally touch it. In essence, the look features chunky highlights beginning subtly near the root and expanding through the length. Balayage translates literally to “sweep”, reflecting the way in which this technique is performed. 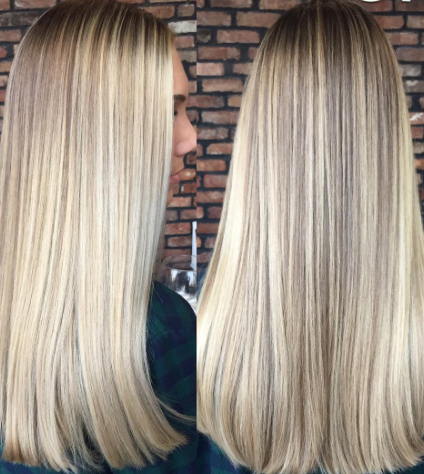 Unlike traditional foiled highlights that are placed evenly in a pattern on the head, Balayage highlights are painted on by hand in a sweeping motion moving from the base to the tip of the hair. Color is applied lightly to the base and generously at the tip. If you are looking for an all-over lightened look with the same color running from root to end, highlights are your calling. Just remember that highlights require routine touchups every 4-6 weeks depending on degree of lightening. Balayage results in a more subtle, less all-over lightened style. Since the root typically remains untouched & strands become lighter toward ends, the grow out process is less obvious & only requires a touch up every 3-6 months. The benefit of highlights are that they provide an all-over lightened look, allowing for a more natural, consistent & organized effect in achieving a blonde hair color. Foil techniques can be used for colors other than blonde, but lighter locks reign in popularity. 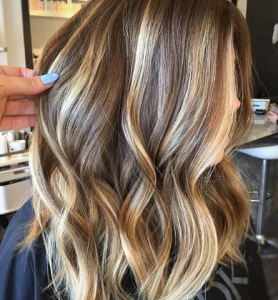 The ease of Balayage has been popularized by models and actresses all over the world. The technique lends a gorgeous, healthy finish that looks sun kissed, glossy and expensive. 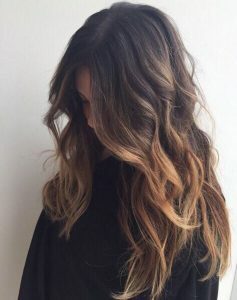 How to choose salon in Chicago for Balayage? Balayage can be natural or strong, whatever you want, it’s all about the application technique. Fringe / A Salon Inc has quickly become one of the “Best Balayage Salons” in Chicago. Through in salon education and a commitment to create the perfect balayage for our guests, , Fringe is on top of the trend and uses lightening clay to achieve the best results. This lightening clay dries on the outside but stay wet and active on the inside of the strand. Thereby keeping your Balayage neat and in control. This spring, the hair color looks are all about Balayage! It’s low maintenance, looks carefree, natural, and is a modern technique that is flattering on most types of hair. Healthy hair is attractive hair and that’ll never go out of fashion. Call to set up a complimentary consultation and find out how the best Balayage salon in Chicago can transform you.